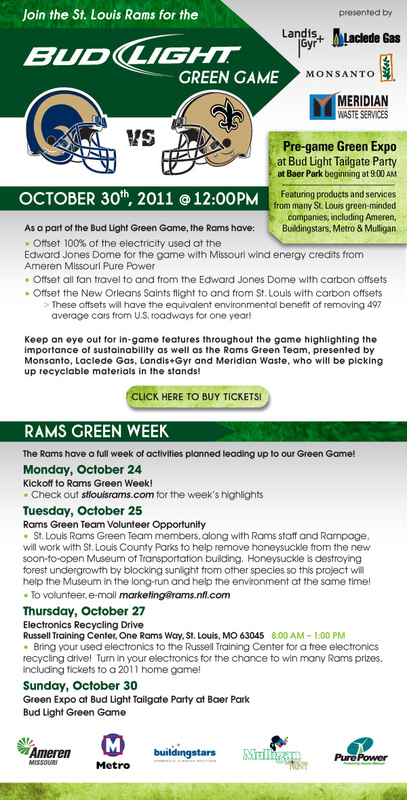 The St. Louis Rams have taken big steps in the past few years to reduce the organization’s carbon footprint and because public transit helps the environment by reducing carbon emissions from vehicle traffic, the Rams have teamed up with Metro to celebrate Green Week. During an average weekday, Metro Transit reduces traffic congestion and pollution by taking about 45,000 vehicles off the region’s roadways. 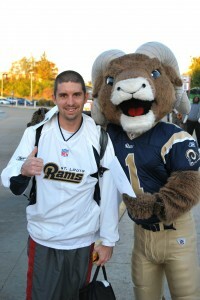 The Rams team mascot, Rampage, is out at Metro locations all week meeting public transit riders. He will give a pair of tickets to Sunday’s Green Game, against the New Orleans Saints, to the first person he sees wearing Rams attire at each MetroLink or MetroBus location he visits this week. Yesterday, at the North Hanley Metro Transit Center, Rampage spotted Jason Bell from St. Louis wearing a Rams jersey and presented Jason with two free tickets to the Green Game. Metro customers who are Rams fans have four more chances to win a pair of tickets to Sunday’s game. Tomorrow, October 26, Rampage will visit the Fairview Heights MetroLink Station from 4-5 p.m.
On Thursday, October 27, Rampage will meet Metro customers at the Shrewsbury Metro Transit Center from 7:30-8:30 a.m. and then Thursday afternoon, you can find Rampage at the Riverview-Hall MetroBus Center at Riverview and Hall Streets from 4-5 p.m.
On Friday, October 28, Rampage will visit Metro Transit passengers at the Civic Center Metro Transit Center at 14th and Spruce in Downtown St. Louis. Also as part of Rams Green Week activities, the Rams will give fans a chance to recycle their old electronics at Rams Park this Thursday from 8 a.m. to 1 p.m.
On Sunday, October 30, Metro will participate in the St. Louis Rams Green Expo event in Baer Park across from the Edward Jones Dome before the Rams and Saints Green Game. Be among the first 500 fans at the Green Expo and get a recyclable Rams tote bag– a gift from the team.